This is my first post. Yay. Anyway, this mod just replaces a handful of things from the NSMBU theme and replacing it with NSMBW. Including but not limited to: Pallete. Music, and Tileset. Im not done, which is why its Beta, with this yet but Ill try to finish it as soon as possible. The background and Objects/Enemies with Normal Maps will have to wait because I don't know how to replace them. So, yeah... enjoy. How did you make the custom background? 1. There is a way to edit normal maps, if they are flat(one color) then its pretty easy. If you want them to be a custom type, then its a lot harder, but possible. 2. The Edges on the tilesets are because there are transparent pixels around the main object, so you might wanna remove those. If you want them to stay, then you will have to turn off the shadows by doing...what game was it, oh NSMBU, by editing WU_SceneDB in Static.pack. It's near the bottom if you full-screen it. For the blue filter, I think its because you should to Abood's "Ancient" method of importing custom tilesets. I didn't have this issue while making NSMBW Tileset for the NSMBU Theme...Until I think Night Yoshi told me it was an Ancient Method. Try to replace all the FieldEnv objects with their original counterparts, just keep them in DDS Format before you do, same as the Tileset. Then follow Abood's Custom Texture Method and import it into SMM, but before you boot the game, replace the original FieldEnv objects with the DDS ones that I told you to save using Abood's BFRES Tool v4.1. I hope this fixes your problem, if it doesnt, then PM me or DM me, im still new to this site and used to Discord, so... yeah. If you want to know how to make custom Normal Maps you can also DM or PM me. I own a Black Wii with Wii Sports and Wii Sports Resort,Black 32GB Wii U with Mario Kart 8 Preinstalled, Blue 2DS with Mario Kart 7, Neon Red and Blue Nintendo Switch, and an Xbox 360 with Minecraft. now how do you run it on your 3/2ds? A little background here, this was actually possible a *LONG* time ago, but I was kind of stupid back then and allowed one little mistake to stop the whole test before I tried it out in-game. So here you go! 4. The Normal Map that you want to replace the original with. So you're gonna want to make a new folder, name it whatever you want and place everything in the "Requirements" Section into that folder. (Not Paint.net, that should not be in the new folder) Open BFRES Tool v4.1 and click "File" then "Open". Navigate to find your BFRES and double click it. you should automatically see a couple or a ton of DDS Files in the folder of the original BFRES. Find the DDS with the words "Nrm" in the name. Rename the file at the end from .DDS to .DDS2. Windows will probably ask you if you *really* want to change the name because then it might become unusable but just click "Yes". 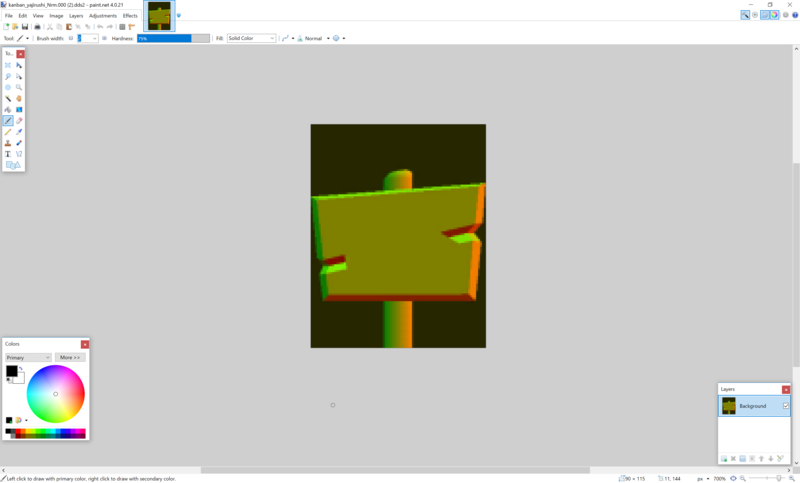 Once you do, open the DDS2 with Paint.net and just paste your custom Normal Map in there. Note that the normal map will have to have the Blue Channel already removed. Here is a Tool to help you remove channels if you dont know how to do so: https://www.vg-resource.com/thread-26680.html. Once you've done that, press "File" then "Save as". Change the format from DDS to DDS2 and replace the original one that BFRES Tool v4.1 had exported for you. In the Settings bar, for the formats, change the Format from whatever it was to "BC5 (Linear, DX 10+). In In the Error Metric bar, press "Perceptual". Then click "OK" on the Bottom-Right Hand Corner of the page. Exit out of Paint.net and rename the DDS2 ,that Paint.net has exported, back to DDS. Open BFRES Tool v4.1 and re-open the orignal BFRES again. Scroll down to find the name of the DDS that you edited. Click it, navigate to the one that you edited and double click it. A little window should pop up saying "Done!" that means that you've sucessfully imported a custom Normal Map into the BFRES. NOTE: If you open up the BFRES with Wexos Toolbox and you see that your Normal Map is transparent, that does not mean that it didnt work. It did, trust me, this was the mistake that I did a while ago. Posted on 08-19-18, 12:10 am in How to make custom Normal Maps. Posted on 08-19-18, 12:13 am in How to make custom Normal Maps. Posted on 08-19-18, 12:16 am in How to make custom Normal Maps. Of course, just give be a bit of credit for the base mod, alright? Posted on 09-17-18, 10:38 pm in Can Someone Send Me A Dumped Game File Of Mario Maker 3DS? Might not happen, consider the fact that RPX edits are required to add things. Page rendered in 0.198 seconds (with 1.396 MB of RAM).